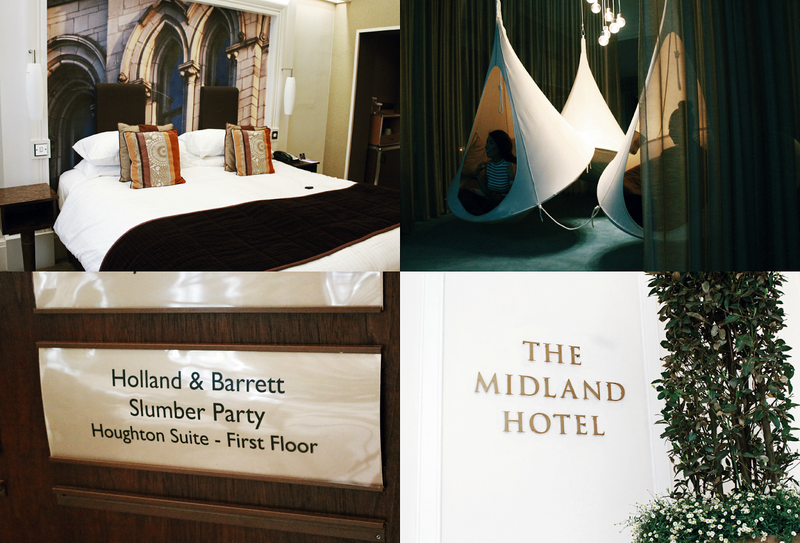 Last weekend, myself and five other bloggers had a relaxing stay at the Midland Hotel in Manchester for a Holland & Barrett slumber party! The day and evening was filled with lots of fabulous treats and goodies. Including a three-course meal made with Holland & Barrett's products themselves! I've always been a fan of the store for my vitamins and my dad's protein powder but never fully understood the uses for their wide variety of products! I'm going to share with you some photos of what we got up to. After meeting each other, relaxing and getting checked in at The Midland Hotel. Having a hotel room to myself was absolutely lovely! We went for a hand massage inside the hotel's luxurious spa and chilled in the relaxation room (the pods are so cool!). In the evening, we chatted over a delicious looking three-course meal. To be honest, I was quite scared about tasting the unique flavours as the menu included many foods I had never tried before - but I left nothing on my plate, it tasted far more better than I expected, I could eat it all again! For the starter, I went for the Beetroot Cured Royal Fillet of Salmon, it used Almond Nut Butter and Apple Cider Vinegar and the green-looking powder is Barleygrass Powder and Pistachio Kernels mixed together. All of the flavours blended together so well, words can not explain how enjoyable it was! The next plate consisted of a Portabella Mushroom Brioche Pudding that was topped with Quinoa baked in Low Salt Vegetable Stock Cubes and a mouthwatering taste of Butternut Curd. I also tried Pumpkin Seeds for the first time. Lastly, the Green Tea and Ginger cheesecake desert was divine! (they used Green Tea Bags for this) Anyone who knows me, knows I love cheesecake! On the side we had Mango sauce (again, my favourite), Pineapple and Coconut Powder which was surprisingly very pleasant! Just reminiscing about this is making my tummy rumble, we were definitely spoilt! A range of beauty treats were also left in our room and I've been giving them a whirl the past week. I'm going to do a separate post of my first impressions which I can't wait to do! Overall I had an amazing experience and I am inspired to include these products into many more of my dishes. It was so lovely to meet you! I really enjoying reliving this experience through your blog.